The Hypro 3D nozzle was co-developed with Syngenta to provide enhanced coverage while reducing spray drift. Pesticides play a key role in making cropland more productive. But exposing unintended sites, including nontarget crops, to chemicals through spray drift can result in wasted product, crop damage and thousands of dollars in claims. More importantly, it can cause injury to people, livestock and environmentally sensitive areas. Spray drift can happen during pesticide application, when droplets or dust travel away from the target site. To reduce the chances of accidental pesticide movement, the agricultural community, including Syngenta, is investing in research and development geared to improve spray nozzles and pesticide-delivery technology. One example is the partnership between Syngenta and Pentair Hypro, a spray nozzle manufacturer. Together, the two companies have engineered the new-generation Pentair Hypro® 3D Nozzle. It alternates backward and forward on a boom to provide three-dimensional coverage of vertical targets, including grass weeds, soybeans, cereals and soil clods. @SyngentaUS shares tips to mitigate spray drift. The nozzle also helps to reduce drift by 60 percent to 75 percent at low pressures, compared with a standard flat fan without air induction. That level of drift reduction allows more product to cover plants and provide better pest control, says Nick Fleitz, an agronomist at Pentair Hypro. Fleitz reports that the Syngenta fungicide field trials in Brazil showed a 10 percent yield increase using the 3D nozzle versus other standard nozzles, due to better coverage and canopy penetration. Coverage for many pesticides, including the Syngenta portfolio of crop protection brands, is best with small droplets, but can also be good with larger droplets, such as those resulting from air-induction applications. The key is finding the sweet spot between optimal efficacy and drift mitigation, Ledson says. To help growers and applicators reach that sweet spot, equipment manufacturers like John Deere are on a constant quest to develop new technologies. For example, John Deere’s ExactApply™ nozzle-control system maintains consistent droplet size and pattern across a wide range of speeds while reducing drift. This John Deere system offers pulse-width modulation that allows the sprayer to operate at a consistent pressure and droplet size, regardless of sprayer speed and application flow rate. Pulse-width modulation systems can maintain nozzle flow rate across a wide range of sprayer speeds and minimize overlap with individual nozzle control and flow-turn compensation, according to University of Nebraska research. No one nozzle fits all spraying conditions. 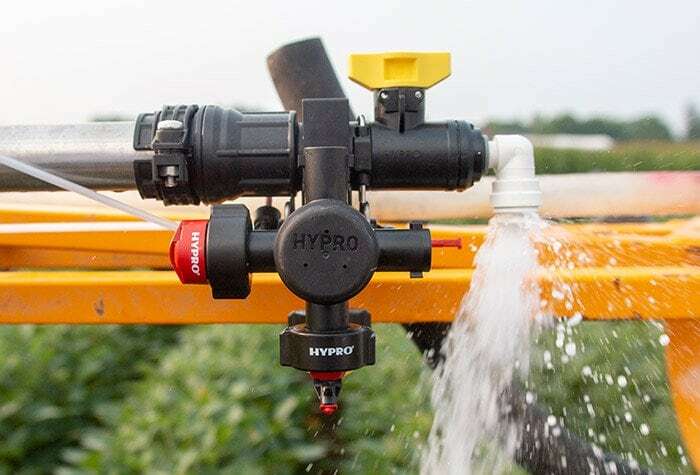 To help growers and applicators determine which nozzle may be best suited for the intended use, pesticide manufacturers, including Syngenta, have added recommendations on specific nozzle types to their product labels over the past several years. Product labels also include information on carrier rates, droplet sizes and drift precautions, along with additional guidance that may prohibit applications under certain weather conditions. Adjust nozzle(s) and pressure to make droplets larger than 150 microns. Larger droplets fall faster, so they are less likely to drift with the wind. Use additives that reduce droplet size sparingly. Apply pesticides during wind speeds of 3 to 10 mph. Higher wind speeds can increase the risk of drift. The University of Arkansas Research and Extension Service concurs and adds that because wind is the main cause of herbicide physical drift, growers and applicators should avoid spraying when wind speeds exceed 10 mph or on gusty days. Keep the spray boom height set only high enough to provide adequate nozzle pattern overlap. Avoid spraying during the heat of the day, when evaporation is more likely. With the start of the pesticide application season just around the corner, Ledson encourages growers and applicators to follow these guidelines and contact their local Syngenta representative with any specific questions that may arise.